How can I remove foam from skin? How can I remove foam from clothing, carpet or other surfaces? How does foam sealant compare to other types of insulation? Is Touch 'n Foam fire retardant? Is Touch 'n Foam waterproof? Can Touch 'n Foam be used to insulate a wall? How do I store and restart a partially used can of Touch ‘n Foam? Where should Touch 'n Foam be used? Will Touch 'n Foam harm the ozone layer? In what temperatures should I use Touch 'n Foam? Can Touch 'n Foam be used outdoors? Will Touch 'n Foam prevent insects or rodents from penetrating into the home? Can foam be trimmed or painted? Why won’t foam come out of the can? How do I store Touch 'n Foam? Can I reuse Touch 'n Foam? Do surfaces require any special preparation before applying Touch 'n Foam? Do Touch 'n Foam products qualify for the Federal Tax Credit Energy Efficiency rebate? If the foam has not cured (it is still moist), it may be removed by wiping off with a dry cloth. Do not use soap and water as moisture helps to cure foam. Use a thick layer of petroleum jelly or Vaseline over the areas that are affected, then wrap your hands in plastic. This could be plastic wrap from the kitchen, plastic dishwashing gloves, or even a shopping bag. Wait for 1 hour. During that time, the skin will release natural oils from under the foam, the Vaseline will be on top of the foam, and the plastic bag will hold body heat close. All together, this will begin to soften the foam enough to remove it carefully from the skin. If necessary, repeat the process. Once the majority of foam has been removed, use a pumice stone or workman’s soap with pumice to gently remove the remaining residue from the skin. Anything remaining will wear off within a few days. No solvent will remove cured (dry) foam. Cured foam is not harmful to health. If the foam has not cured (it is still moist), it may be removed by wiping with a clean, dry cloth or by using acetone (or nail polish remover containing acetone). Do not use soap and water as moisture helps to cure foam. No solvent will remove cured (dry) foam. If the foam has already cured (it’s firm and dry), it cannot be removed from clothing, upholstery or carpets. Cured foam may be trimmed, scraped or sanded from rigid surfaces; however, this may result in a need to repaint or re-stain the surface. Note: Always test a hidden area before applying acetone to any surface, as damage may result. Unlike caulking materials and other sealants that are solid, heavy and non-insulating; foam sealants expand to form an outer skin that contains closed air cells that provide an effective barrier against energy loss. Touch ‘n Foam will not shrink, dry or harden, and it doesn’t pull away from the material it has bonded to, making foam the best sealant available against air and moisture infiltration. Yes. Touch 'n Foam sealants meet the criteria of flame / smoke spread to be classified as a Class A foam. While these sealants are fire retardant (self-extinguishing when flame is removed), they are not intended to be used a fire barrier or fire stop. Touch 'n Foam insulating sealants are water-resistant and form an airtight seal when applied properly. No. Touch 'n Foam insulating sealants are formulated to fill cracks, gaps and small voids and require ventilation and humidity to cure. Larger voids may not allow enough air penetration for proper curing and may require special techniques to insulate properly. Touch 'n Foam products should not be used around tub surrounds. How do I store and re-start a partially used can of Touch ‘n Foam? A can may be re-started for up to three weeks if it has been stored properly with the straw still attached to the adapter and can. Simply bend the straw back and place the straw tip on the plastic nub atop the trigger adapter. To re-start, cut the end off the straw (removing cured foam), shake well and follow the application directions on the can. Touch 'n Foam makes a full line of insulating sealants that can be used all around the home to stop air leakage and drafts. Use around windows and doors, plumbing fixtures, electrical outlets (around, not inside, junction boxes), baseboards, sill plates, exhaust vents, siding edges, sky lights, attic fans, garage ceilings, etc. Review our Uses for Foam and Energy Saving Tips pages for more ideas. Note: Do not use Touch ‘n Foam where it will be in contact with bare copper wires (such as inside a junction box). Read product labels to select the right sealant for your particular job. Touch 'n Foam insulating sealants are manufactured to be upper-ozone safe and environmentally friendly. Use black Landscape foam for exterior uses such as koi ponds when you need a plant and fish safe foam. For best results, the can should be at room temperature with an ambient temperature between 60°-100°F (16°-38°C). Home Seal has the ability to cure in both higher and lower temperatures. Polyurethane foam sealants require some humidity to be present in order to cure properly. We recommend Touch ‘n Foam Landscape foam for exterior applications. Landscape will not discolor or break down in sunlight like other foams. It is plant and fish safe, and the dark color blends into shadows well. Touch 'n Foam MaxFill and Home Seal formulas may also be used indoors or outdoors. These foams should be painted when used outside in order to prevent discoloration and break down from UV exposure. Foam can be painted in about one hour after dispensing. Touch 'n Foam No Warp, Fire Break and Easy Fill should be used indoors only. Touch 'n Foam insulating sealants do not contain any nutritive value and provide an effective barrier against insect and pest intrusion; however, some persistent pests may chew through cured foam. Touch 'n Foam recently launched Mouse Shield Foam Sealant + Blocker as a specialty foam containing an EPA-registered pesticide that protects the foam from attack by mice, birds, bats and tree squirrels. It also blocks ants, roaches, spiders and bees. Yes, after allowing the foam to cure. Foam can be trimmed, sanded or painted about one hour after application. Follow instructions carefully to be sure you have attached the adapter securely and that you are holding the can in the right direction (upside down or right side up). Shake the can well. In some cases, if the can has been stored improperly, pressurized air may have leaked from the valve leaving the can without propellant. In that case, return the can to the store where it was purchased and exchange for another. Store can upright below 90°F. It’s important to keep the can upright to ensure air doesn’t leak from the valve until ready to use. Never store Touch ‘n Foam in your vehicle. Touch ‘n Foam is reusable for up to three weeks after initial use. 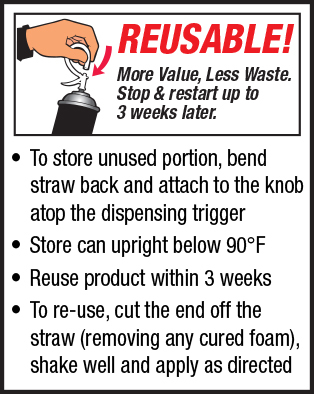 To store unused portion, bend straw back and attach to the knob atop the dispensing trigger. Store can upright below 90°F. Reuse product within three weeks. To re-use, cut the end off the straw (removing any cured foam), shake well and apply as directed. Surfaces should be free of oil and dirt to promote adhesion. Yes. Touch 'n Foam Insulation does qualify for the Federal Tax Credit under The Energy Policy Act of 2005, when used for insulation purposes, in new or existing residential dwellings. Download and print our Energy Credit Statement here.